It’s the populist trend of the moment – put the word “radical” in front of something benign, and try to make it sound sinister. Yet, as Mr Bernier surely knows, Canada is and has been a multicultural society since the beginning – since before the beginning, if you include the Quebec Act. Canada has a richly diverse population that hails from all over the world. Today, roughly one in five Canadians is foreign-born. While you might think this is a statistic that works in Mr. Bernier’s favour, it isn’t. In 1921, 22 per cent of Canadians were foreign born, and in 1871 16 per cent of Canadians were newcomers. This ratio isn’t some “radical” new development; it’s who we have always been. These migrants have historically come from across the world as well, with waves of migrants hailing from non-Western countries like China, Japan, Pakistan, Sri Lanka, Somalia, etc. The first Arab-Canadian Member of Parliament (Pierre De Bane) was elected in 1968; the first Chinese Canadian MP, Douglas Jung, was elected in 1957. There have been Filipino-Canadian MPs, Iranian-Canadian MPs, Jewish-Canadian MPs, and on and on. Foreign-born Canadians from all sorts of non-Western countries have served at all levels of government in Canada, crafting policy and influencing agendas. You’d think that the radical consequences of radical multiculturalism would have made themselves felt by now; instead, Canada is consistently listed as one of the best and safest countries to live in worldwide. There’s a reason so many people make the choice to uproot themselves and their families to come live here. Diversity has always, and hopefully will always be our strength. The tenets of Canadian multiculturalism are pretty simple – equality of access and equality of treatment, respect and inclusion, the freedom to be respected for who you are. You can read the details of Canada’s Multiculturalism Act (1985) here. The returns of multiculturalism have been enormous. 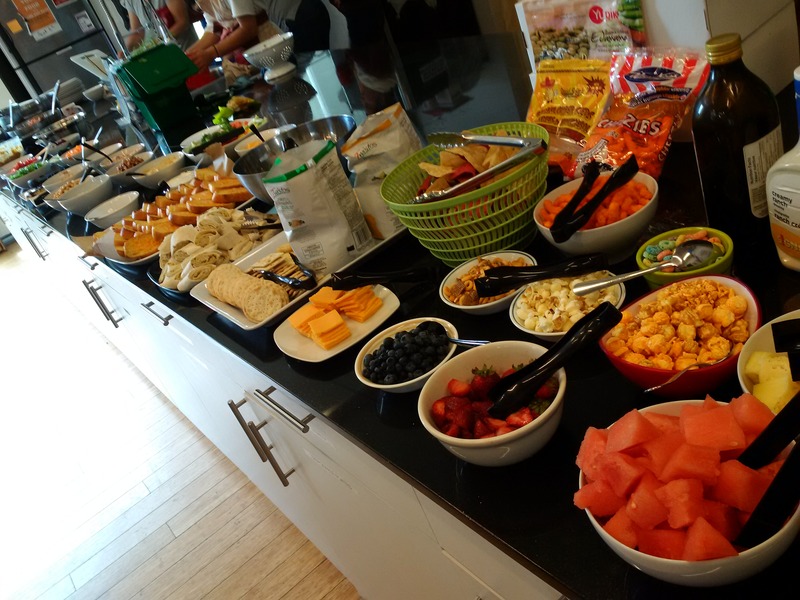 At a basic level, we have access to a greater variety of options in cuisine, music, art, fashion, etc. Beyond that, Canada and Canadians are enriched through the inclusion of different philosophies, varied approaches to problem solving, economic advantages from having connections in and insights into foreign markets – the list goes on. Which brings us to the second half of Bernier’s argument – the one that hinges on values. Bernier is counting on his intended audience to be wary that people from non-Western countries don’t share the same values as those of European descent do. He doesn’t spell out what these differing values may be, but it’s not hard to find out what he’s hinting at. In a recent post, WHTO contributor Charlotte ‎Crober laid out the kinds of “values” concerns being raised by nationalists like Maxime Bernier – and pointed out that they are nothing new. If anything, the exact same concerns being raised against modern-day migrants have been raised before, and not just about non-Western newcomers. There was a time when some Canadians thought that European migrants from countries like Ireland, Italy and Poland didn’t have the same work ethic, family values or respect for law and order that Canadians did. It wasn’t true then, and it isn’t true now. In fact, it’s easily proven that the most basic of human values is universal. The Golden Rule – treat others as you wish to be treated yourself – pops up in the key texts of every major religion in the world. Islam, Hinduism, Judaism, Budhism, Sikhism, even Christianity all have their own variation on the theme. We tend to focus our attention on the things which we see as different, particularly extreme or better yet – radical. It’s particularly true in politics, where the threat of those differences plays a big role in driving donations and votes. You need to create a distinct value proposition making clear to the people why they are a threat, and we are the only ones who can keep that threat at bay. It’s cynical in the extreme, but it’s the way the game is played. It can also be extremely harmful. One of the Canada’s darkest chapters was when we sent Japanese Canadians to internment camps on the assumption that “they” weren’t like us, and were in fact more loyal to Japan than to the country they called home and, in many cases, had been born and raised into. Probably the darkest chapter in our history involves the radical mistreatment of Canada’s indigenous populations. The Residential School system was set up with the explicit intent of indoctrinating First Nations youth into Western culture. Children were ripped away from their homes and families, coerced to deny their own culture and language and forced to be something they were not, suffering horrible abuses along the way. In both these instances, Canada betrayed what is not just a key Western value, but a universal moral principle – to treat others the way we ourselves would wish to be treated. 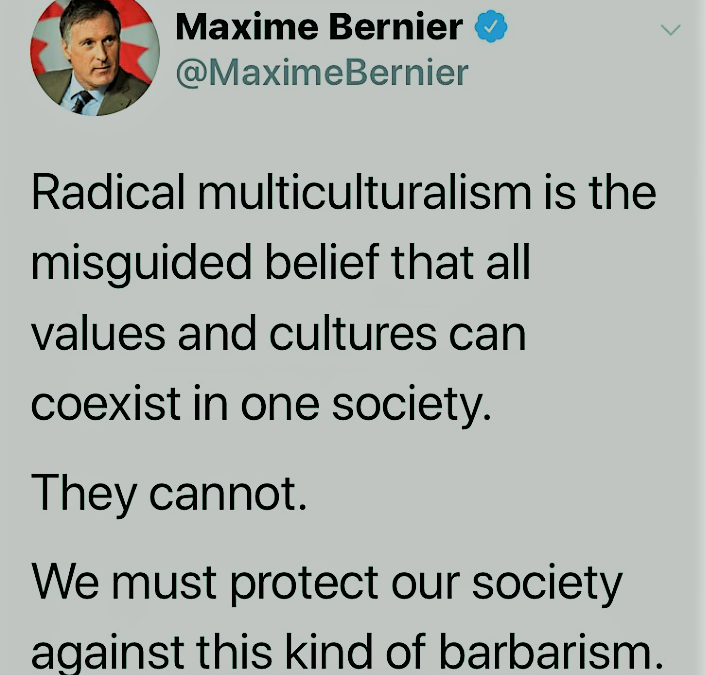 By suggesting that immigrants must “adopt widely shared Canadian values, Western civilization values”, Bernier is not only ignoring the successful, multicultural history of our country, he is also echoing the most shameful acts of our past. He is implying that “they” don’t share the same basic values as we do, and the implication in this could not be more clear – if they don’t value things the way “we” do, then they don’t deserve the same respect and treatment “we” do. This stands in contrast to what our own Canadian experience tells us – that diversity is a strength, and that we all, no matter where we come from, share the same basic values. It’s by allowing everyone who comes to Canada to be true to themselves, requiring only that they respect others for doing the same that we have become the great nation that we are. Maxime Bernier’s approach does nothing to “make Canada great again” – it threatens everything that makes us great already. Whatever his intentions, Mr. Bernier’s position is the one that is misguided; as we’ve seen elsewhere in the world, it’s radical nationalism that presents the greatest threat to our values.